Dr. Laura Workman, a native of Louisville, went to state rival University of Kentucky to complete her undergraduate training from 2000-2004. She then returned to Louisville to the University of Louisville where she completed both medical school, graduating in 2008, and residency, finished in 2012. She served as chief resident for the internal medicine-pediatrics program during the calendar year 2011. In her time as chief, she led a series of board review sessions and was awarded a teaching award by her fellow med-peds residents in 2011. 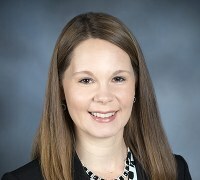 Following her love of teaching and residency education, Dr. Workman chose to stay at the University of Louisville as an Instructor in the Departments of Medicine and Pediatrics, serving first as the Associate Program Director and then the Program Director for the Internal Medicine-Pediatrics Residency Program. Dr. Workman is married to Joshua Workman, a mechanical engineer, and they have four daughters: Leah, Zoe, Riley and Olivia. Outside of work she enjoys movies of all types, fiction reading, shopping, and taking her girls to the park. Dr. Bishop is a Hoosier (she still lives in Southern Indiana and crosses state lines daily). She is a graduate of the University of Louisville Med-Peds Residency Program and is pleased to continue as the Associate Program Director. She serves as an Academic Hospitalist in both the Pediatric and Internal Medicine Departments with some time spent in outpatient Internal Medicine. She has an interest in medical education and is active in the undergraduate medical school as a facilitator for problem-based learning groups, mentor in the Introduction to Clinical Cases course, and teaches portions of the Disease & Therapeutics (formerly Pathology) course. She has received several teaching awards from residents and students and is a co-founder of Louisville Lectures where she serves as Director of Digital Media and Website Design. Her other interests including nail art, planning Walt Disney World vacations (for anyone! ), skincare, baking and entertaining. She is married to George Melton, who owns a comic book and board game store and she is active in the maintenance of their online boardgame store. Dr. Holthouser is a native of Louisville who completed her undergraduate studies at the University of Notre Dame, 1991-1995. She attended the University of Louisville for her Postgraduate Training, 1995-1997. Dr. Holthouser graduated from The University of Louisville School of Medicine in 2002, and completed her residency in Internal Medicine and Pediatrics at the same institution in 2006. 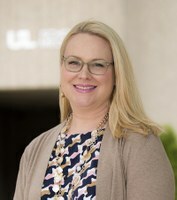 She subsequently joined faculty at U of L in 2006. Her academic responsibilities include directing the Interdisciplinary Clinical Cases course for first and second year medical students and assisting with the Internal Medicine Clerkship for third and fourth year students, as well as clinical patient care and bedside teaching for residents and students at Kosair Children's Hospital and the University Hospital on the U of L Health Science campus. Educational honors include: The Excellence in Clinical Education Award as a resident in 2003 and 2004, election to AOA as one of three residents out of a campus of 600 candidates by the medical school class of 2005, The Internal Medicine Program Professionalism Award given by consensus of her fellow residents in 2006, and winning the Gender Equity Award from the American Medical Student Association in 2007. Dr. Holthouser's area of primary interest is student education, with a special interest in forging links between basic science knowledge and the clinical care of patients. She is married to Tom Pierce, a freelance writer. She has a stepson Ian and two daughters, Cady and Evie. Areas of interest outside of the medical field include cooking, gardening, home improvement, real estate, and fiction reading. Charlene K. Mitchell, M.D., M.S.P.H. Dr. Mitchell graduated from the University of Illinois College of Medicine, completing her Combined Internal Medicine-Pediatric Residency there in 1988. She earned her MSPH in Decision Science at the University of Louisville School of Public Health and Information Sciences in May 2004. She joined the faculty at the University of Louisville in 1989 and currently holds the academic title of Associate Professor of Internal Medicine and Pediatrics. Dr. Mitchell has held several administrative teaching positions over the years, and served as the Program Director for the University of Louisville Combined Internal Medicine/Pediatric Residency Program from 1989 to 2003. Her clinical teaching responsibilities include precepting medical students, medicine and medicine/pediatric residents on Internal Medicine wards at University Hospital. She served as co-investigator for a three-year (completed in April 2007) study on the Louisville Integrated Primary Care Training Program for the Department of Health and Human Services Administration’s Graduate Psychology Education Program. Currently, she serves as hospitalist at the University Hospital, where she is also the Chair of the Pharmacy & Therapeutics, as well as the Utilization Management Committees. She served as med/peds chief resident during her fourth year of residency and went on to become the pediatric chief resident the following year. At the conclusion of her chief year, she remained at Loyola University as an Assistant Professor in Hospital Medicine. Her current clinical responsibilities include serving as an inpatient teaching attending at University Hospital as well as a primary care physician at the UofL Physicians Outpatient Center. Dr. Alexander attended University of Louisville School of Medicine and then completed his Internal Medicine & Pediatrics Residency at University of Kentucky. He went to Baylor College of Medicine to train in Pediatric Cardiology and Adult Congenital Heart Disease. See Dr. Alexander share more in this video. He has been instrumental in our transitional heart program. Dr. O'Hagan graduated from Queen's University in Kingston, Ontario. After his Combined Internal Medicine-Pediatric Residency at the Cleveland Clinic Foundation, he completed a Pediatric Pulmonary Fellowship at Washington University in 2000. He joined the University of Louisville in 2010. Although he spends the majority of his time working in pediatrics, he is also active in the adult Cystic Fibrosis clinic. His main interests include all aspects of adult and pediatric cystic fibrosis, including newborn screening and transition of these patients to adulthood. Dr. Michael Ruppe graduated from the University of Toledo College of Medicine and then completed his combined Internal Medicine-Pediatrics residency at the University Hospitals of Cleveland/Rainbow Babies and Children's Hospital in 2006. He went on to complete a Pediatric Critical Care Medicine fellowship at the Children's Hospital of Philadelphia. With a focus in pediatric Cardiothoracic Critical Care, Dr. Ruppe came to U of L in 2009 and assumed a leadership role as the Medical Director of Cardiac Critical Care Services within the division of Pediatric Critical Care at Kosair Children's Hospital. Dr. Ruppe's clinical interests include cardiac intensive care and transplantation medicine. He enjoys teaching a variety of students, residents, and fellows and his current research is focused on the evolving uses for bedside ultrasound in critical care. He is married to Vanessa Ruppe who is a nurse practitioner and epilepsy surgery specialist in the division of pediatric neurology. They have two children, Joseph and Elizabeth. Dr. Ruppe is an aspiring marathon runner and enjoys landscaping and playing with his kids and goldendoodle named Lollipop. Dr. Thomas Stephen graduated from Medical College, Kottayam (University of Kerala), India. After his Combined Internal MedicinePediatric Residency at the Henry Ford Hospital, MI, he completed a Pediatric Gastroenterology Fellowship at University of Louisville School of Medicine. He is board certified in Internal Medicine, Pediatrics, and Pediatric Gastroenterology. Dr. Stephen works within the Division of Pediatric Gastroenterology serving infants and children of Kentucky and southern Indiana with gastrointestinal, hepatobiliary, pancreatic disorders and nutritional problems. I was born and raised in Hindman, a small town in Eastern Kentucky. From there, I moved to Danville, Kentucky where I got my B.S. in Biology from Centre College. After college, I attended the University of Kentucky College of Medicine where I was nominated to the Alpha Omega Honor Society. I remained at UK and completed an Internal Medicine/Pediatrics residency. After residency, I traded the big blue for red & came to Louisville to complete a Primary Care Sports Medicine Fellowship. I fell in love with the city, as well as my husband, and decided to stay and join Dr. Becker as a sports medicine faculty member. Some of my medical interests include the female athlete triad, concussions, chronic exertional compartment syndrome, sports nutrition and joint injections. My interests outside of medicine include shopping and photography. Dr. Tzanetos completed her undergraduate degree, medical school, and Med-Peds residency at the University of Kentucky. Following residency, she completed a fellowship in pediatric critical care while also completing a master of science in clinical investigation at Vanderbilt University. She has been on faculty at the University of Louisville since 2013. She served as medical director of the Just for Kids Critical Care Center from 2015-2017. With the development of the Jennifer Lawrence Cardiac Critical Care Unit, Dr. Tzanetos took on a new role as Medical Director of Cardiac Critical Care at Norton Children’s Hospital in 2017. Dr. Tzanetos also has an interest in extracorporeal support and serves as the PICU director of ECMO. She is married to Doug, an allergist, and has two daughters. She loves to travel, read, and spend time with her family and friends. Dr. Folsom attended medical school at Loma Linda University before heading to Charlestown for Med-Peds Residency at the Medical University of South Carolina. She went to Indiana University for a combined fellowship in Adult and Pediatric Endocrinology. Our community Med-Peds physicians play a major role in training our residents in the basics of primary care as well as the business of medicine during clinic. They are also engaged in mentoring our residents.